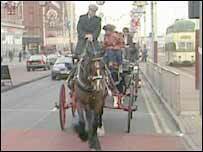 A plan to fit Blackpool's famous promenade horse carriages with dung-catchers has been approved. Blackpool Council has given the go-ahead for the horse nappies to be attached on the resort's 44 landaus - the carriages pulled by horses. The move follows a consultation which found visitors, residents and businesses believed manure hindered the attractiveness of the seafront. A spokeswoman said all the nappies should be fitted by next summer. The Landau Owners Association supported the decision, taken by the council's Licensing Committee on Thursday, after initial reservations. Ten lockable bins have been put on the promenade to enable landau owners to empty the horse droppings.